The quartet appeared on Show 304, recorded in Wellesley, MA, on March 26, 2015. The Brunnendale String Quartet includes 17-year-old violinist Caroline Joyner from Ridgefield, Connecticut; 18-year-old violinist Claire Walter from Keene, New Hampshire; 17-year-old violist Chris Rogers-Beadle from Hingham, Massachusetts; and 17-year-old cellist Erica Ogihara from Miami, Florida. 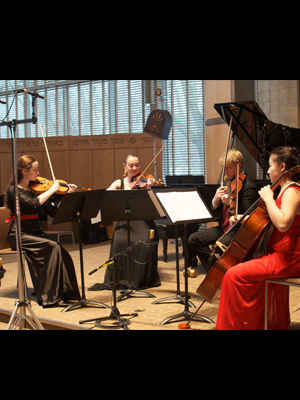 The quartet is coached by Laura Thielke, cellist and Director of Chamber Music at the Walnut Hill School for the Arts in Natick, Massachusetts.